The art of brewing, according to ancient records, dates at least from Noah and his Arc. 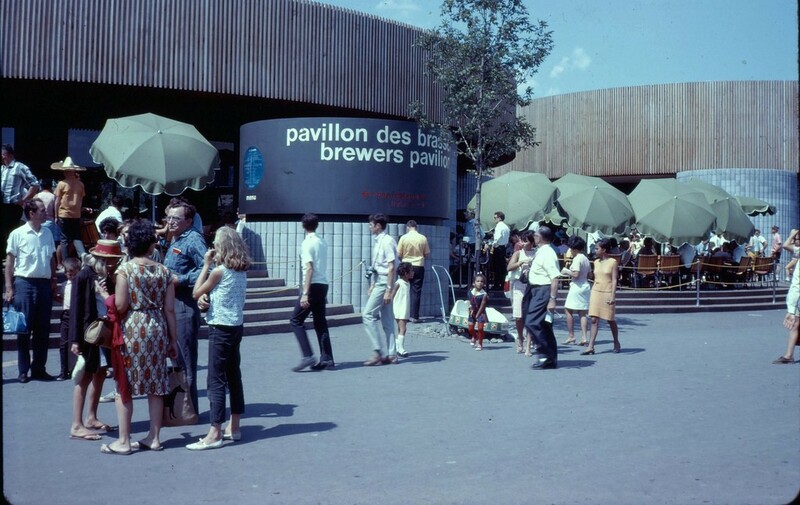 Imaginative exhibits in the Brewers Pavilion on Ile Sainte-Hélène relate the story of beer in Canada to that of Man and his World. The pavilion is a minute's walk from Métro, Expo-Express and Minirail stations. 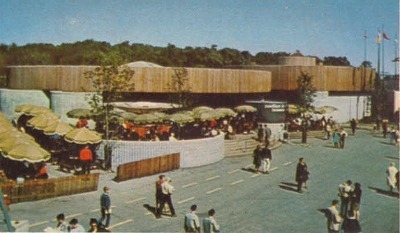 Built with a unique type of curved concrete block, it contains a restaurant-beer garden called La Brasserie, an exhibit area and a miniature theater in which the world-famous Canadian Puppet Theatre gives 15-minute bilingual performances continuously from 10 a.m. to 9:30 p.m. daily. Image from the Claude Latour collection with our sincere thanks. A visit to the pavilion will provide relaxation and enjoyment for the whole family. An imaginative menu of hot and cold dishes from across Canada is available both in the air-conditioned restaurant and in the colorful outdoor beer garden. Children's portions and soft drinks are available, and sixty brands of bottled and draught beer. Every visitor to the pavilion is offered a free attractive souvenir book in English and French. It features food recipes using beer and also unusual entertainment ideas. Click here to see a map of the Brewers floor plan.